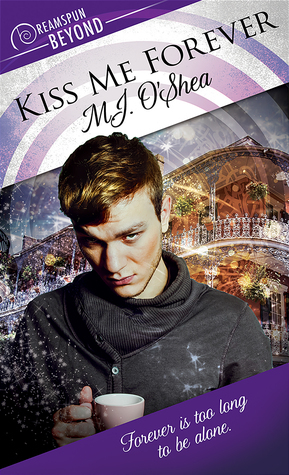 Kiss Me Forever by M.J. O’Shea is the seventeenth book in the Dreamspun Beyond series. This is the first book that I have read by this author, and I quite enjoyed the authors writing style. She did a great job of making me wonder what kind of paranormal Tyson is as well as his live-in housekeeper/companion Mrs. Peggs. For the longest time, I was sure Tyson was a vampire but nope no go. Then I was thinking that he was like Dorian Gray and he had a portrait somewhere that was keeping him young. But that was wrong also. So to say that I was invested in the story if only to figure out what he was, was a given. I also enjoyed all of the supporting characters, like the other paranormals Donovan, Dan, and Brooke and Avery’s group of friends, Vaughn and Macy and his teacher’s assistant, Kelsey. They helped flesh out the storyline and through them we got some more history and details about the main characters, Avery and Tyson. I hated Tyson’s ex-girlfriend, who every couple of decades comes around and makes his life hell and will threaten the people in his life that he cares about to get her way. I thought the author did a great job with the ex-girlfriends character as I screamed at Tyson that he should really kill her more than once especially when he pushed Avery away in order to keep him safe, not that it was very successful. I liked Avery, but I thought he was a little dense at times. Like when they went to the paranormal bar for the first time. I would have thought that he would have picked up on the paranormal aspect of the people faster since he teaches local paranormal history and has a class called Origins of Myths and Legends. But alas nope, he doesn’t trust his instincts or really questions why Tyson and his friends are different, and when he does ask questions, he allows them to be brushed aside. So that kind of kept me from loving him in the beginning but his character grew on me as their relationship progressed. I really liked Tyson. He’s been around for six centuries, and he loves to learn so the fact that he looks around the age of a college student has really helped him fit in around campus. When he gets bored with life he goes back to college and gets another degree. He likes to keep to himself and guards what kind of paranormal he is even from his friends that he’s known for centuries. He learned that hard lesson centuries ago from his ex-girlfriend. But when he meets Avery for the first time, it’s love at first sight, and they can’t stay apart. That is until his psycho ex shows up again. Now Tyson has to decide how to handle his ex. He can’t do what he normally does by disappearing until she gives up on trying to find him, not with Avery in his life. Will he allow her to ruin his relationship or will he finally do something about it? Tyson will have to decide just how much Avery means to him. I liked this book, and it lived up to my expectations of the Dreamspun Beyond series. I would read another book by this author.